The type of albinism in HPS is a tyrosinase-positive form, which means that individuals may present with varied amounts of pigmentation. 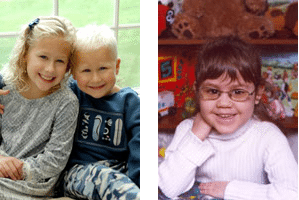 Some persons may have very light hair and fair features and be diagnosed with oculocutaneous albinism or OCA, while others may appear to have dark hair with albinism in their eyes only and be diagnosed with ocular albinism or OA. The visual impairment in persons with HPS is the same as in other types of albinism. It is a result of abnormal development of the retina and optic nerves. This causes decreased visual acuity which is frequently severe enough to be legal blindness, photophobia (light sensitivity), strabismus (crossed eyes), and nystagmus (involuntary movement of the eyes). Visual acuity typically ranges from 20/50 to 20/400. All people with HPS have nystagmus. Often the nystagmus can become more obvious when a person with HPS is tired, anxious, angry or under stress. This side-to-side eye movement may lessen with age. In persons with significant pigmentation, nystagmus may be the only outward indicator of HPS. Use of aspirin, ibuprofen and drugs (both prescription and over the counter) that affect platelet function can make the bleeding tendency worse! Ask your doctor and your pharmacist before taking medications. Hermansky-Pudlak Syndrome involves a bleeding disorder caused by a platelet defect. Platelets are involved in one of the mechanisms that exist within the body to counteract bleeding. Platelets are made in the bone marrow and circulate in the bloodstream in large quantities. They act directly to plug small leaks in vessels by clumping (aggregating) and obstructing flow, and indirectly by releasing substances that trigger a chain of events that culminates in a clot. These chemical substances (ADP, serotonin, calcium, ATP, phosphate) are normally stored in platelet dense granules. These dense granules are little sacs, or compartments, that are embedded in the outside membrane of the platelet. Filled with the stored chemicals they look like “chips” and the platelets appear to look like a “chocolate chip cookie” under an electron microscope. These chemical substances are destined to be released to assist in clotting. In Hermansky-Pudlak Syndrome, these dense granules are missing. Therefore, no substances are released. 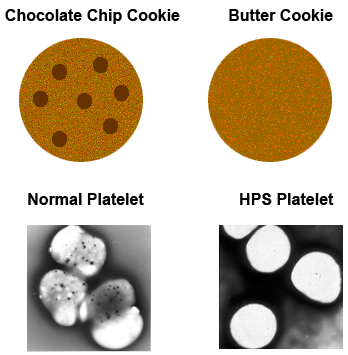 The platelets appear to look like a “butter cookie” instead of a “chocolate chip cookie” under an electron microscope. Standard laboratory blood test results are not abnormal in HPS. Prothrombin time (PT), partial thromboplastin time (PTT), and platelet counts are all normal in HPS. Bleeding times can be normal though they are often prolonged. The clinical result of the defect in HPS can be seen in a bleeding tendency that varies from quite mild and hardly noticeable to life threatening. There is a possibility that people with HPS that encounter severe bleeding problems might also have a decrease in platelet von Willebrand’s factor activity, another blood component responsible for normal clotting. Viewing prepared platelets under the electron microscope is the definitive diagnostic test for HPS at this time; however, commercial genetic testing is available in limited cases. Since all the genetic variants of HPS have not been identified as of yet, diagnosis through molecular analysis is not comprehensive. For more detailed information click here. People with HPS may have a tendency to bruise easily. They may experience frequent nosebleeds or when cut, tend to bleed longer. Some people with HPS may have unusual bleeding episodes (e.g., heavy menstrual bleeding, bleeding with dental procedures). This bleeding problem varies in individuals from very mild to life threatening. When the intestines become affected it can cause a problem that resembles a common disease called Crohn’s disease. Upon colonoscopy (a procedure done using a scope to visualize the inside of the colon) granulomas or sores, may be seen skipped around the intestines. Also similar to Crohn’s disease, inflammation and ulcerations can occur through membranes and fistulas, fissures and rectal tags may occur. The typical age of onset for HPS Inflammatory Bowel Disease (IBD) is similar to the age of onset for Crohn’s, the teen years. Only 15 percent of people with HPS develop IBD. Management of the IBD of HPS can be challenging. In some cases the question arises whether the problem is bad bleeding, or bad bowel disease? Careful discussion should take place between you and your doctor before considering surgical options. It may cause diarrhea, weight loss, cramps, and blood in the stool. Some individuals report experiencing joint pain, mouth sores and in one case, Pyoderma Gangrenosum. When lungs become affected, shortness of breath, exercise intolerance, and abnormal fatigue might be a sign. Often patients report being diagnosed with asthma. As symptoms progress, people with HPS may have a chronic dry cough. 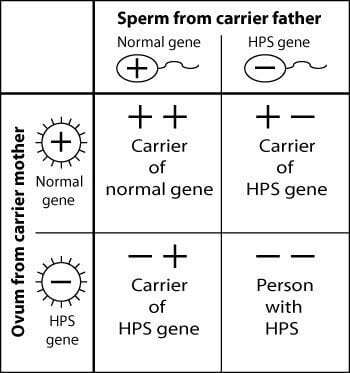 HPS is an autosomal recessive disorder, meaning it is expected to be carried by both parents. When two people carrying an HPS gene have a baby, they have a 25 percent chance, with each pregnancy, of having a child with HPS. They have a 50 percent chance, with each pregnancy, of having a child that carries an HPS gene, but is unaffected. Finally, there is a 25 percent chance that the child will not have HPS or be a carrier. 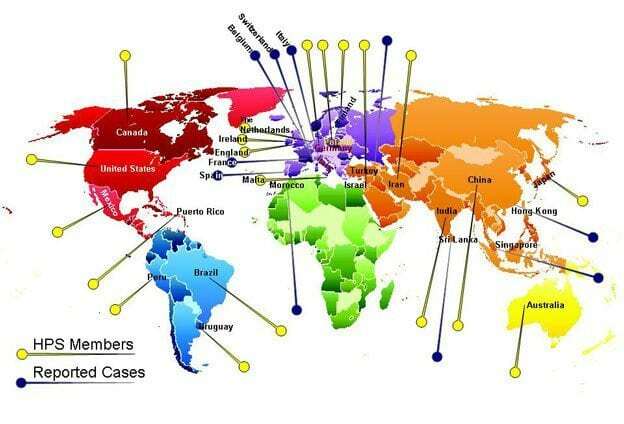 HPS occurrs in all nationalities around the world. HPS1 is extremely prevalent in Puerto Rico. One in 20 people in the northwestern part of Puerto Rico carry the HPS1 gene. One in 1,600 in this region have HPS1. HPS3 is also common on the island, primarily in the central region. One in 60 people on the island carry the syndrome. Across the globe, the incidence of HPS is somewhere between 1 in 500,000 to 1 in a 1,000,000. This is a conservative estimation because the disorder is so frequently undiagnosed. Researchers believe HPS may also occur with greater frequency in Japan and Switzerland.